Hunting in the Cahora Bassa Region of Mozambique - Off the shores of Lake Cahora Bassa lies some of the best hunting in Mozambique. If you are looking for a fantastic leopard in daylight hours, a monster crocodile or giant hippo, you have found the right place. Our Mozambique hunting concession in the Cahora Bassa area has produced many fine trophies over the last few seasons, including excellent leopard success. Tiger fishing is a popular activity to add to your hunt. Leopard = All leopard taken in daylight hours. Four out of four. Excellent quality on big Tom leopards. Not many locations can provide this kind of daylight activity on mature leopards. Crocodile = Out of the fourteen crocodiles taken in the 2012 season, the average length was a staggering 14.6 feet! That is a truly phenomenal figure. If you are after a giant crocodile, you have found the right place. Hippo = With the sheer number of hippo in the Cahora Bassa, you are sure to take a great Hippo. In 2012, the largest hippo was a monsterous 31". To ensure quota availability, all required trophy species must be reserved early. Excluded from the pricing are tips to PH's, camp staff, trackers and skinners, trophy documentation, dipping, packing and shipping of trophies as well as hotel accommodation before and after the safari. Clients typically stay over in a South African hotel for one night before departing for the hunting area the next morning. Clients travel to Johannesburg, South Africa, where we pick them up and fly to the hunting area the following day. Day fees are charged per available hunting day. All local payments must please be made in cash. Personal cheques can unfortunately not be accepted. 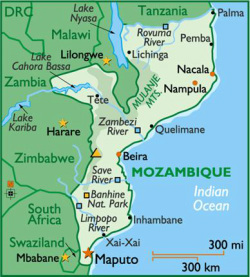 The Mozambique hunting season is from June to November.